Portuguese Sardines for sale. Buy online at Zingerman's Mail Order. Gourmet Gifts. Food Gifts. There are actually dozens of different fish sold as sardines in the U.S. Most are either brislings from Norway or herring from the North Atlantic. While they aren't bad, they don't come close to the flavor of true pilchards like these. And unlike Norwegian sardines, these are never smoked, so the full flavor of the fish comes through. Open a tin, and you'll find four or five fine silver sardines nestled inside. I like to serve them simply, laid on a slice of toasted farm bread and dressed with great olive oil. Add a pinch of salt, a twist of black pepper, a squeeze of lemon and eat 'em up. 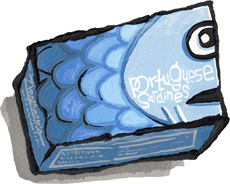 "The taste is not fishy or salty but soft and delicate and dark."